Even though Facebook has permanently banned conspiracy theorist Alex Jones and Periscope has temporarily banned him, he appeared on both platforms Thursday to claim America will soon be shaken by a “false flag” attack. Jones made the assertion during a brief appearance on the August 16 edition of War Room, a show produced by his Infowars outlet that remains unaffected by the social media bans and is still allowed to broadcast on Facebook and Periscope. But Jones circumvented these restrictions by appearing on War Room, a program that has flown under the radar of sanctions imposed on Jones by Facebook, Twitter, and Periscope. War Room, a three-hour weekday broadcast that airs on Infowars.com, terrestrial radio, and several online broadcasting platforms after The Alex Jones Show, is hosted by Infowars’ Owen Shroyer and President Donald Trump confidant Roger Stone. The show has also provided a platform for white nationalist guests including Nick Fuentes and Faith Goldy. During the show’s August 16 edition — while Shroyer and Stone were bantering about the possibility that Stone could be criminally charged as part of special counsel Robert Mueller’s investigation — the sound of a door being slammed caught the co-hosts’ attention. Jones then walked onto the set and talked about a Federal Communications Commission enforcement action against a pirate radio station that has broadcast his show. He then switched topics to say, “The false flag’s coming, gentlemen,” as he exited the studio. In recent days, Jones has repeatedly claimed the existence of a plot by mainstream media outlets and high-profile journalists to stage gruesome “terror attacks” against themselves that then can be blamed on Jones and Infowars for political gain and to garner sympathy. 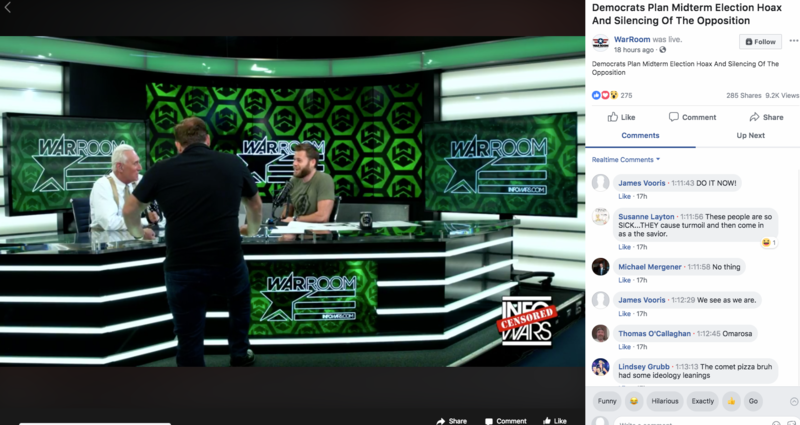 Despite actions Facebook has taken against Jones, War Room’s page remains active and was broadcasting a livestream when Jones made his appearance. While the show no longer livestreams on YouTube, its channel and numerous previous episodes are still available there, even though the site has banned Jones’ primary account. And the Periscope account the show streams from is separate from the one that has been limited by the seven-day timeout targeting Jones’ account.